Haley Lu Richardson was trained to be a dancer, but she ended up with two cool professions instead – as an actress and a dressmaker. The Phoenix-born actress has maintained great grace in smoothly switching into entirely different characters in the various movies she has graced which include, playing as Krista in The Edge of Seventeen (2016), Claire Benoit in Split (2017), as Kendall in Last Survivors and as Casey in Columbus (2017). Haley portrays her characters splendidly, no wonder she quickly featured in about 12 films and 10 television series. Her honed skills have been noticed and attracted to her, the 2017 Gotham Independent’s Film Award nomination which she won. Haley Lu Richardson is unlike most up and coming actresses, as she has stepped away from stereotypes from the word go. Haley Lu Richardson (Lu is a middle name coined by her dad) was born on March 7, 1995, in Phoenix, Arizona. Her parents are Valerie and Forrest Richardson. Her mother is a professional market and creative designer and her father draws plans for golf courses for a living. She had her early education at Villa Montessori and later enrolled in Arcadia High School in Arizona. The only child of her parents, Haley was trained very early in life to embrace dancing as a profession and was a member of Cannedy Dance Company in Arizona, Phoenix, from 2001 before moving to Hollywood California in 2011 at the age of 16. Though not dancing professionally, she spent several hours a week in dance training to stay in shape. Even though she is a citizen of the United States, Haley is of a multi-ethnic descent – on her father’s side English, German, Scottish and Welsh and on her mother’s side French-Canadian. Her acting career took off in 2013 when she was given a regular role in ABC Family series Ravenswood where she portrayed the character of Tess. She made a guest appearance on Disney Channel’s sitcom Shake it Up and costarred in the pilot production of the ABC TV program Adopted, as well as in the movie Escape from Polygamy where she portrayed Julia alongside fellow American actor Jack Falahee. Haley got her first real movie lead role in 2014 when she played Kendal in Last Survivors and followed it up with her role in The Young Kieslowski the same year. She held down a supporting role in 2016 Edge of Seventeen and psychological thriller Split. Haley Lu Richardson did not appear in the limelight until her role as Casey in the 2017 American drama Columbus, a movie that earned her a Gotham Independent Film Award for Best Actress that year. Haley featured in the 2018 movie Operation Finale and is expected to star in a post-production American romantic drama Five Feet Apart alongside Cole Mitchel Sprouse. In 2009, Haley Lu Richardson started a crochet clothing and accessories line tagged Hooked by Haley Lu. The multi-taleted beauty has her current net worth pegged at $300,000. She may have other streams of income which are still under review. Hopefully as the years go by and as she makes more appearances, the actress will definitely earn more. 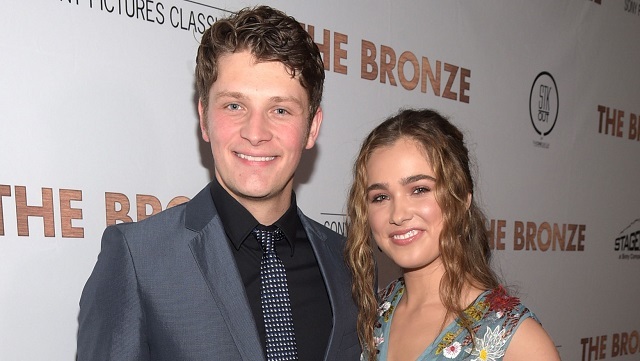 Haley Lu Richardson hooked up with Canadian actor Brett Dier since 2014. The couple set eyes on each other for the first time in New Orleans in 2013. Brett Dier is famed for his role as Michaelo Cordero Jr. in the TV series Jane the Virgin. His first TV appearance dates back to 2006 when he played Matt Peterson in the movie Family in Hiding. He held down a minor role in the Diary of a Wimpy Kid in 2010 where he portrayed a break-dancing role. Dier’s role in Ravenswood as Luke Matheson swept audiences off their feet before he hit the limelight in the Jane the Virgin. Haley’s boyfriend is not only an actor but a multi-instrumentalist who plays the guitar and piano as well as a great break dancer. Their affair was kept under wraps until the couple went public on social media in an Instagram post in December 2016 and from there onwards, the pair has flaunted their affection for each other for all to see. Interestingly, the couple got engaged in March 2018 when Haley Lu proposed to Dier. She revealed that the proposal was spontaneous, out of nowhere type. She threw the question, “Do you want to marry me”? After a brief show of emotion by both of them, they laughed and cried before Brett accepted her proposal as he was swept off his feet. But, the pair agreed to abide by the term boyfriend instead of the conventional fiancé that most couples use after their relationship status has been upgraded. Haley showed off her ring as she posed for a picture. The Columbus star is round-faced and has regular brown hair (the actress regularly styles her hair with various interesting hairdos). Standing at 5 feet 2 inches (1.57 m) in height, she weighs 51 kg (112 pounds).